Reports that movie box offices, music CDs and records and broadcast TV are dead seem to be premature. Reports of the death of the TV, box office, and music industry have apparently been greatly exaggerated. The year 2015 has seen Super Bowl XLIX become the most-watched TV event in history, "Jurassic World" grab the biggest box office opening ever, and Adele's "25" shatter the single-week sales record for albums by nearly a million copies. The film industry is on the brink of implosion, network TV is going to be extinct by 2030, and last year's breakout album, Taylor Swift's "1989," is the last platinum album ever, right? 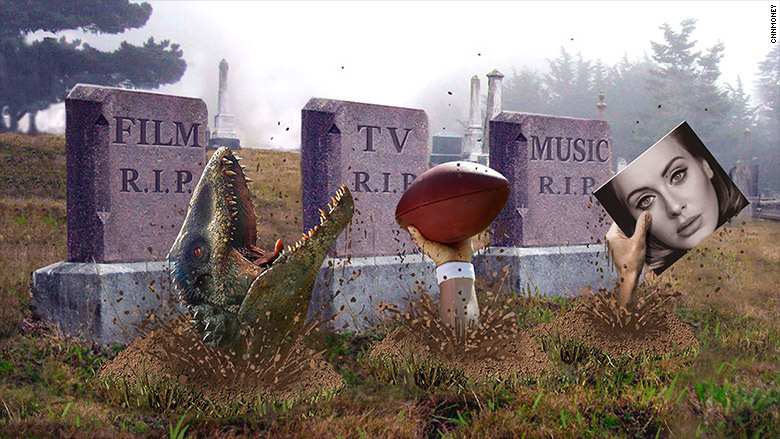 This year has proven that while the current entertainment media landscape is in turmoil, it's showing signs of health. This year's media records may have an asterisk by the facts that the NFL is a ratings powerhouse, movie ticket prices are inflated, and music tracking only goes back to 1991. Nevertheless, the achievements are impressive because there's more competition for eyeballs then ever before. The TV industry has to deal with Netflix, Hulu, Amazon Prime, Facebook, Twitter, and YouTube, but Super Bowl XLIX was still watched by a record 114 million viewers. While the Super Bowl always brings in big and sometimes record-breaking numbers, other TV programs like Fox's "Empire" and the presidential debates have seen noteworthy ratings this year. So how is television getting 114 million viewers to watch a football game or nearly 17 million to watch a weekly hip hop drama when there's so much competition? 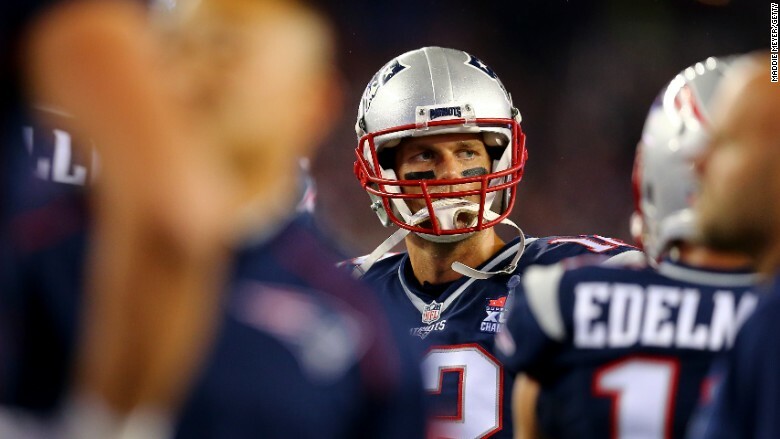 The NFL is a ratings powerhouse, but TV had other notable and record-breaking ratings events in 2015. According to Brad Agate, the research director at Horizon Media, what is supposedly killing the medium is, in a way, also helping it. "I think shows like 'Empire' and 'The Walking Dead' have benefited from on-demand viewing," said Adgate. "I certainly think that 'Walking Dead' saw a boost from being put on Netflix. People found the show, liked it, and decided to start watching it live." Adgate also noted that while TV ratings are much lower than a generation ago that the quality of the programming and the viewing experience is better. "Over the past 10 years the emergence of video on demand and DVR systems has allowed viewers to catch up with shows," Adgate said. "And you see those results on the ratings with shows like 'Empire.'" As for the film industry, the record $208 million U.S. opening of "Jurassic World" led the way to what could be a record busting year. It's an impressive feat especially since the 2014 summer box office had its worst totals in 17 years causing hand wringing in the industry. 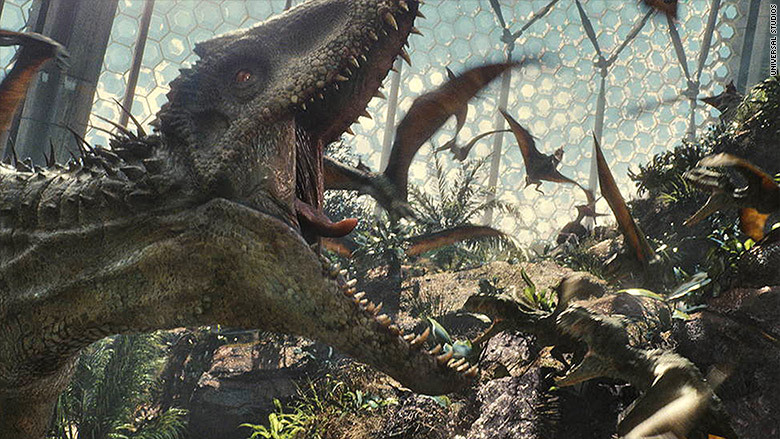 "Jurassic World" roared through records in 2015. One year after Hollywood had a dismal summer. The film industry has also had to deal with multiplying media options that keep audiences out of the multiplexes. However, a distraction like social media is also acting as a great marketing tool for studios. "It's always been true that content is king, but never before have people had the ability to make commentary available to everyone instantly," said Paul Dergarabedian, senior media analyst for Rentrak (RENT). "If a piece of content is great, we can all know about it in about 10 seconds." And great content is benefiting from the media fragmentation. Adele's "25" for example was highly anticipated since her previous album "21" sold 11 million copies in 2011. 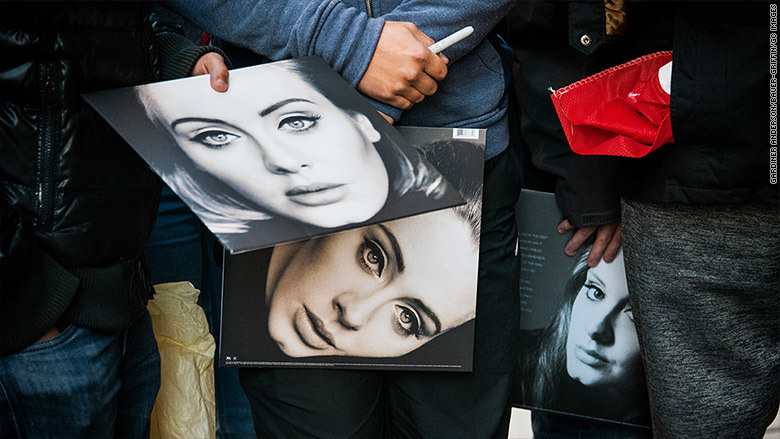 So Adele didn't need a big publicity push to get "25" to 3.38 million copies in a week, social media did it for her. "When you seen a number this high you have to have a lot of non-traditional music buyers, and you don't get that without reaching a broader audience," said David Bakula, senior vice president of insights at Nielsen Music. "It shows that there is a pent up demand for really great music... that's made bigger by reaching areas that don't normally get reached... and that's where we're talking about the fragmentation of the industry." Adele's "25" has gone multi-platinum in less than two weeks. Last year, some said we may never have a platinum album again. But while the TV, film and music industry have had many record events this year (and possibly another on the way with "Star Wars: The Force Awakens"), the challenge becomes how does it boost the content that isn't at or near the top already? "It's a noisy atmosphere. There's a lot out there and a lot of competing interests," Bakula said. "If it's not the Super Bowl, if it's not Adele, how does it rise above?" For the industry that could prove to be the essential question.